The President of Convocation, Ms Lorna Houston, invites attendees to join her for refreshments at 17:00, before the meeting. For catering purposes, kindly RSVP by Thursday, 6 December 2018. Active alumni participation in the Annual General Meeting of Convocation is important. Watch the video to hear why other alumni think it matters. For additional information, email us at: alumnievents@uct.ac.za. The Annual General Meeting takes place in accordance with the Statute of the University of Cape Town. Notices of motion must be submitted in writing to the Secretary of Convocation at registrar@uct.ac.za by no later than Wednesday, 7 November 2018. Meetings of Convocation are restricted to members of Convocation. Please refer to the footnote for confirmation of the composition of Convocation. The notice of the Annual General Meeting will be sent to Convocation member email addresses we have on record. 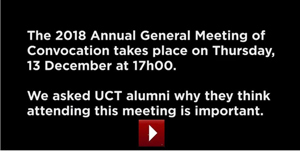 It will also be published on the UCT website, the UCT Facebook page, the UCT Twitter page, the UCT Alumni Connect portal and the Alumni LinkedIn page. Please refer to the links below (downloads) to access the draft minutes of the 2017 AGM of Convocation and the agenda for the 2018 AGM of Convocation. (c) those former professors and associate professors elected by the senate to be emeritus professors or emeritus associate professors.